Cats can be very lovable and a whole lot of fun, but you can’t forget that you have to be responsible for caring for their basic needs. There are so many different responsibilities that come along with owning a cat. You must feed them and give them fresh water each day, take them to the veterinarian, and make sure that you scoop their litter box regularly. The litter box duty is probably one of the most dreaded responsibilities that a cat owner must take care of. Today we will learn how to train your cat to use the toilet, but first – the importance of cleaning your cat’s litter box. Scoop your cat’s litter box each day to avoid clumps that may form if it sits for too long. Add fresh litter each day to freshen up the box, and prevent you from running low on litter. Thoroughly clean the litter box and replace it with fresh litter once a week. Use warm soapy water when washing the litter box. Get into a routine so that you don’t neglect the litter boxes. Avoid covered litter boxes, because typically if it is out of your sight, it will also be out of your mind. Have at least one litter box for each cat in your household, and an extra box just in case. If you use these tips when it comes to the litter box, you should be able to avoid litter box complications down the road. The problem is that it can be a whole lot of work. The good news is that there are many cat owners out there that have had a lot of luck ‘potty training’ their cat to use the toilet. You used to hear elderly people speak of cats that actually used the toilet (or I did at least, my grandmother used to brag about it), but it used to be something you just chalked up to dementia or old age, but the truth is that it is possible to toilet train your cat. If you don’t keep your cat’s litter box in the bathroom currently, then it is time to move it in there. It is really best if you put it as close as you can to the toilet, because it will get them accustomed to the area. Once you get them used to using the litter box in the new location, you can move on to the next step. It is best to go ahead and switch over to the right type of cat litter. It is important to choose a flushable litter, because it is essential when you get further into the training process. It is best to go ahead and get them used to the new type of litter as quickly as you can so that the transition will go smoothly. Sometimes it will take a couple of days for them to get used to the new litter, but most cats are not too picky about the type of litter they use. Ultimately, you want your litter box to be the same height as your toilet, but you don’t want this to happen overnight. This can be quite confusing to your cat, especially if they go to use the litter box and it is on the floor and come back and it is up high. This may actually discourage them from using the litter box. It is best to do this slowly. You may start by putting a few telephone books underneath the box at first, and then gradually bump it higher until it is flush with the toilet. Just remember as you raise it to keep it sturdy. This is where it really gets interesting. Once your cat is adjusted to the height of the litter box, it is time to get them adjusted to using the toilet. This is where it can be a bit tricky, and your cat may not catch on immediately. Put the litter box on top of the toilet, and watch to see if they are still using it. 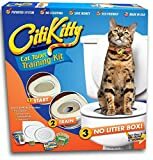 When you make the transition to ditch the litter box once and for all, you will need to make a temporary box for your cat to get used to the toilet. Using a large sheet of wax paper (or even better – a cat toilet training kit), you can create a barrier over the top of the toilet. Then, close the seat down and put flushable litter on top of the paper. This will still keep the toilet familiar to them so that they want to use it to eliminate. Once they begin using it, cut a hole in the paper, and each time the cat uses the toilet you can cut a larger hole, until eventually you won’t need to use the paper and flushable litter at all. It will just become second nature to them. If they are completely confused without the paper, then you may put some of the litter into the bowl so that it will help them to know what they need to do. When your cat is taking the transition well, you need to reward him. Each time he uses the toilet, you will want to give him a treat. He will then associate it with good behavior that is pleasing to you. Have treats handy throughout the day and reward the good behavior with positive reinforcement. One thing that you really need to be aware of is the fact that it isn’t going to happen overnight for your cat. They won’t just automatically start using the toilet on their own. It takes dedicated training to teach your cat to eliminate in the toilet, and honestly some cats won’t catch on as fast as others. If you understand that it will take time, and you are patient with your cat, chances are you will succeed and they will be toilet trained before too long. Just remember, if your cat seems confused at any step along the way, it may be a good idea for you to take a step back and go back to the previous stage. It is all about tricking your cat’s mind until it becomes normal for them to use the toilet. We would be lying if we say that every single cat out there will successfully use the toilet with the right amount of training. There are going to be some cats that just don’t catch on to what you want them to do. In these cases, there are other options that can make litter box duty easier around your house. Most cat owners have at least heard of the automatic, self-cleaning litter boxes. While some of them do work effectively, there are others that aren’t really worth your time or money. Make sure that if you opt for an automated litter box you choose one that is actually going to get the job done. If you are just sick and tired of scooping a litter box day in and day out, why not give this method of training your cat a try? You never know, it may work for your cat, and imagine the amount of money you will be able to save by not having to buy cat litter each week! Have you had any success when it comes to toilet training your cat? If you have a story, or any tips that may help our readers to successfully train their cat to use the toilet, feel free to comment below and share your stories and ideas. We value the support from our readers, and really appreciate your input.